Growing up my Grandma gave my cousin and me 'collectables' for Christmas every year. 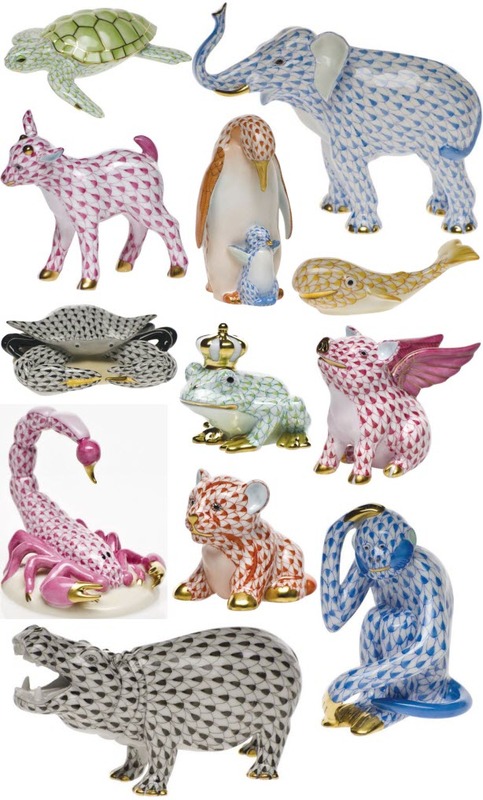 I collected small Swarovski animals (the all clear ones like a little mouse, frog and elephant of course) and my cousin collected small Herend boxes and figures. I guess its never too late to start a collection. I love herend. I remember some of my friends getting pieces when we were in college and I thought it was so stupid to spend so much money on a little animal. Foot in mouth. It's funny how grandmothers seem to choose what you collect! I collected Madame Alexander dolls, and then I collected dessert plates, and then tins. The only things I brought with me to my adult life were the dessert plates. Those I love. I LOVE Herend. I thought I was the only "non-old lady" person that did. I just got a little blue elephant for Christmas and I'm already trying to choose my next addition. I think it will be the pig with wings in the rust color. Definitely never to late to start collecting! Oh, and I collect souls. Every year, our dad gives us a piece of Herend. It is a collection I cherish dearly and one that makes me so excited and thankful for the tradition. I also collect Herend.My husband started my collection for me on our first wedding anniversary,and we are about to celebrate our 29th anniv.on Feb 19th.I adore Herend,but it has gotten SO expensive....I have some fabulous pieces and I just hope that since I have two grown sons,my future daughter-in-laws will truly appreciate will they will have oneday!!! I collect Herend! My favorite piece is my hippo, he's purple. In highschool my family took a trip to Hungary where it's made... it's a little more reasonable over there. My grandmother collected it, then my mom started (and she's since given me a few pieces). My favorite is one she had signed by one of the artists. I'm really into the black and brown pieces (I only have pastel ones). I think they'd look so chic in a neutral sun room.